Equip advanced hybrid Helitronic Diamond tool grinding and eroding machines with a CNC that would do them justice and provide the quick communication between the user interface, control and generator that grinding and eroding requires. Equip every machine in the Walter Maschinenbau product portfolio with a Fanuc Series 31i -A5 high-end CNC. The series 31i A5 proved the perfect choice given its huge 5-axis functionality, open design and integrated rotary eroding on the control side. FANUC also agreed to modify the control to use Walter’s existing algorithms for electrical discharge erosion. Users not only have a CNC that is ideally suited to the job but also benefit from having only one control and only one supplier. FANUC’s awesome reliability means downtime is practically a thing of the past. As its control, Walter Maschinenbau also deploys the FANUC 31i -A5 CNC for the Helitronic Diamond and Helitronic Power Diamond. 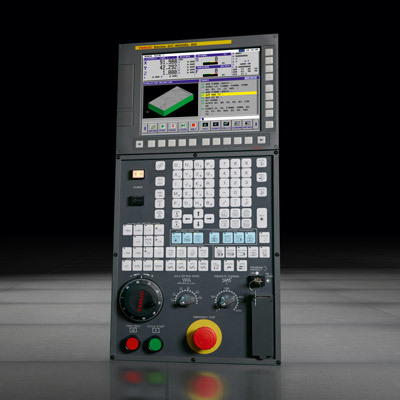 When the tool grinding machine specialist Walter Maschinenbau decided in 2006 to equip its Helitronic series with FANUC CNC controls and drives, one thing was clear to the decision makers: There had to be one model of controls for all the machines. The decision was taken in favour of the Series 31i -A5 FANUC CNC, which offers the best conditions for 5-axis machining, along with an open design for also integrating rotary eroding on the control side. Last year, Walter Maschinenbau, based in Tübingen, gradually switched over its Helitronic machines to the FANUC Series 31i -A5 high-end CNC control: from Helitronic Basic, an entry-level machine for re-sharpening tools, through the standard machines Helitronic Power and Mini-Power, right down to the top model Helitronic Vision, which is equipped with direct drives in all axes. The newly developed Helitronic Micro, which is suitable for the machining of micro tools in a very small diameter range with extreme precision requirements, was designed from the beginning with the FANUC 31i -A5 CNC. It is also completely equipped with linear and torque motors. Finally, both hybrid machines Helitronic Power Diamond and Helitronic Diamond were also switched over to the FANUC control and are successfully used not only for producing and re-sharpening HSS, carbide and CBN tools but also for the rotary eroding of CBN and PCD. "In principle, the Helitronic Diamond is a Helitronic Power or Helitronic Vision grinding machine with an additional generator for electrical discharge erosion and the requisite peripherals, such as a quenching system", explains Martin Hämmerle, product manager for the Helitronic machines. He points out that for rotary eroding on the Helitronic Diamond, no additional Walter-specific eroding control is used. This is integrated into the FANUC CNC control. "In this way, when grinding or eroding, the user can benefit from having only one control and thus only one supplier." In order to enable the communication to the generator and the use of existing algorithms for electrical discharge erosion, FANUC agreed to modify the control accordingly. Heinz Häckh, Head of Control Engineering: "Based on our experiences with rotary eroding, we put forth concrete specifications and expressed various wishes, which FANUC implemented as an option in the 31i -A5 CNC." The most important factor for the grinding and eroding specialists is quick communication between the user interface, the control and the generator. Because in parallel to machining, technology data must be transmitted from the user interface to the generator. The machine can thus not only cover the geometry via the CNC program, but also continuously perform all the necessary corrections in the process. Conversely, measurements and parameters from EDM machining can also be displayed on the control panel. Heinz Häckh can attest to FANUC's stellar support during the entire conversion process: "The requirements specification we developed for the eroding process was completed in a triangular workflow. Firstly, the German subsidiary in Neuhausen was involved, where we have a competent point of contact for all technical questions. Then the parent company in Japan provided invaluable expertise. For product manager Martin Hämmerle, the hybrid Helitronic Diamond machines are a development with considerable potential. Because as he has observed, the market for PCD tools is growing between eight and ten percent annually. This is expected to continue. According to Hämmerle, the key factor driving this is the trend in the aircraft, automotive and other industries towards reducing weight through materials. As a result, there is a preference in favour of light metals such as aluminium and titanium, along with plastics and composites, which are ideal for machining with PCD tools. These enable high speeds and achieve surface finishes that often make further treatment unnecessary. Due to its hardness and geometries such as inner radii, PCD tools are extremely difficult to grind, however, and must eroded instead. That is why Martin Hämmerle sees in the hybrid machines an opportunity for tool grinders to "enter the PCD tool business without any risk. A service provider of that type can use the Helitronic Diamond flexibly: either for re-sharpening or for the production of carbide or HSS tools. For PCD or CBN tools, the eroding unit is available for use." For Walter Maschinenbau, the conversion to control and drive technology from FANUC has proven to be the right move. FANUC, the world market leader in CNC technology with over two million CNC controls sold, is the ideal partner for the international company, thanks to its global presence with worldwide service and spare parts supply. FANUC is also known for superb product quality, which is expressed in high availability and low maintenance costs. "We can confirm that based on our own experience. The reliability of FANUC control and drive technology is so great", mentions Martin Hämmerle, "that we have experienced virtually no control-related down times on our machines. That is why our customers are very satisfied with FANUC. Many have opted for our Helitronic machines precisely because of the reliability and support available worldwide." In addition to FANUC service, the technical characteristics of the FANUC 31i -A5 CNC control are impressive. On all Walter tool grinding machines, the PC-based FANUC Panel i is used as the control panel. The software applications Window Mode and Helitronic Tool Studio developed by Walter also run on additionally available PC technology. The latter is essentially a proprietary Walter CAD system that enables 3D renderings of the work pieces and facilitates programming significantly. "Having the fast communication interface between the powerful control PC and CNC control is important to us", reasons control expert Heinz Häckh. "This enables us to operate in DNC mode with all our programs, because the contours are calculated in the Walter software. And we consistently use the integrated FANUC two-channel safety function, Dual Check Safety, in all our machines. This allows us to save mechanical components, wiring overhead, cabinet space and thus costs. We also use the powerful FANUC Servo Guide optimisation software, especially for service and diagnostics purposes, as well as for commissioning." Whilst the user of Helitronic machines can work with the Walter interface without any specialised FANUC knowledge, the machine manufacturer pulls out all the stops for its basic programming and adaptation. Walter uses the traditional DIN programming and existing macros, along with the C executer. It enables special functions, for example, that manage the communication between the generator, the user interface and CNC program during eroding. The Tübingen-based developers also use the multi-channel PMCs (integrated PLCs) in order to access the sensor-actuator level and control loading devices, for example. Helitronic machines offer myriad automation options. Thus, various loading options are available on the Helitronic Mini Power, Helitronic Power and Helitronic Vision machines for ensuring the automatic supply of work pieces – for tool grinding operations these are tools. It starts out with a basic Eco loader and extends through a disc loader, right down to a multiple pallet loader which is capable of storing more than 500 tools. These options, directly integrated into the machine, can be selected depending on customer requirements. In addition to this are machines with sanding disc changer, which can accommodate up to twelve grinding wheel sets and thus ensure a very high flexibility in machining. A FANUC LRMate200i B robot is available for the Helitronic Micro in its standard configuration as well as for the Helitronic Power and Helitronic Vision as an optional extra feature. As the robots and CNC come from the same company, the communication between the two is implemented via the easy-to-install standard connection, the FANUC I/O Link Bus. The fast control cycles provide for servo and spindle control, and the high resolution of the pulse coder with 1,000,000 pulses per revolution, as well as nano-interpolation, provide for utmost precision and surface finishing of the machined result. The latter, for example, relies on the nano-smoothing function, which converts the linear movements automatically within the control into NURBS curves. Nano-smoothing examines the contour profile generated via CAD programs in small linear steps and smooths it to curves in nano-steps. In the process, a fast and smooth movement is achieved, and the surface finish of the work piece is significantly enhanced. The FANUC software ensures that the position commands for amplifiers and motors are processed in nano-steps. That is why the Helitronic machines use amplifiers and motors of the Series Alpha i, coupled with the HRV Control servo software (High Response Vector Control). They offer fast control and short service cycle times. Walter also attaches great importance to high energy efficiency. Martin Hämmerle explains: "The motors have high efficiency and offer the option of energetic recovery. We also appreciate the compact design of the components that require little space in the control cabinet." In addition to the motors of the Series Alpha i, Walter also deploys direct drives in some machines. Heinz Häckh points out the advantages: "We now have over ten years of experience with linear and torque motors. Thus we can confidently guarantee our customers high long-term quality of machines equipped in such a manner. The wear is minimal and they run more smoothly than with other drive types. By eliminating the ball screws, a higher resolution is achieved by means of high-precision glass scales. In addition, linear motors can be readily deployed in an oscillating motion, which on the ball screw would otherwise lead to excessive wear and other problems." Tool grinding technology from one source. Since the 1950s, tool grinding machines have been manufactured at Walter Maschinenbau GmbH, Tübingen. Walter managed to make a quantum leap in 1994 with the introduction of the Helitronic Power. Since September 2004, the world market leader Walter Maschinenbau has belonged to the machine tools division "Körber-Schleifring" of Körber AG. Walter/Ewag is a worldwide leading market-oriented technology and services company for tool machining. At the company's Tübingen headquarters, 150 employees work in the departments of organisation and management of the Walter Group, as well as in development, sales, prototyping, applications engineering and services. The only production facility is located in the Czech town of Kurim, near Brno. In total, the company employs more than 500 people worldwide. The product range mainly includes CNC machines for grinding and eroding metal, wood and PCD tools as well as rotationally symmetrical production parts. Additionally, Walter Maschinenbau offers its own line of high-precision optical CNC measuring machines with which rotationally symmetrical tools can be measured and recorded.